Kobelco Europe launches online fanshop - Kobelco Construction Machinery Europe B.V.
Kobelco Construction Machinery Europe B.V. (KCME) is excited to announce the launch of its brand new webshop. KCME has offered branded merchandise to its dealer network since 2014. However, demand from Kobelco customers and other construction enthusiasts led to the debut of a public fanshop on the manufacturer’s stand at BAUMA. The popularity of the shop and sell-out success of many product lines, including scale models and clothing, drove the development of the new online resource earlier this year. As well as a complex European dealer network, Kobelco has a huge worldwide consumer fan base, including over 64,000 fans on Facebook. 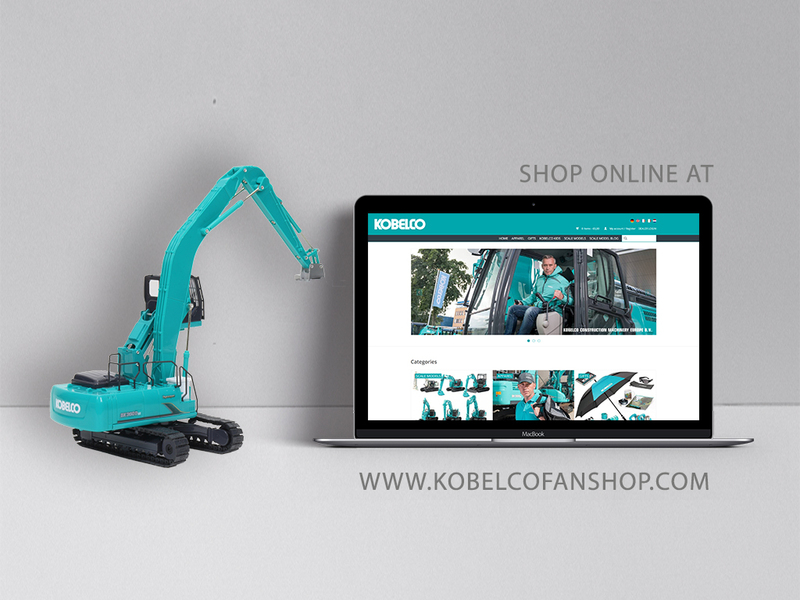 The arrival of the new online fanshop, which is available in five languages, marks a huge step forward for Kobelco, which has previously sold all its products exclusively via authorised dealers. The webshop will give customers access to an extensive range of high quality Kobelco products as well as other important benefits including competitive prices, exclusive promotions and fast delivery.